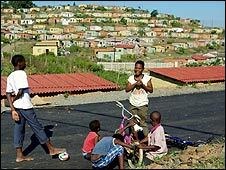 When apartheid was dismantled in South Africa, many expected the lives of its black population would improve but promises of land distribution and new homes have not been fulfilled, as Hugh Sykes discovered. "We didn't like apartheid, but some things were better under apartheid than they are now." "Life here under apartheid was bad, but now it is more bad." I felt slightly unsettled hearing this. It seemed like questioning a sacred belief - that apartheid was an unmitigated, 100% evil system. But there is less idolatry here now, as it dawns on most people that the new South Africa is still scarred by extreme poverty and high unemployment. Of course, Nelson Mandela continues to be lauded as the hero of the liberation of black South Africans from the oppressions of apartheid. But he is also being criticised for changing the direction of the South African economy from active state intervention to neo-liberal, free-market economics. During his presidency, the government switched from RDP - the interventionist Reconstruction and Development Programme - to Gear, which stands for Growth, Employment And Redistribution. RDP promised paradise - clean water, mains drainage, land redistribution and a million homes - all in five years. But paradise did not come. The economy of South Africa simply could not bear the cost. So the finance system switched to Gear. Part of the thinking was that it would help to develop a substantial black middle class, whose taxes would then trickle down to the poor. The middle class did develop, but the problem with trickle-down is that it is just that - a trickle. 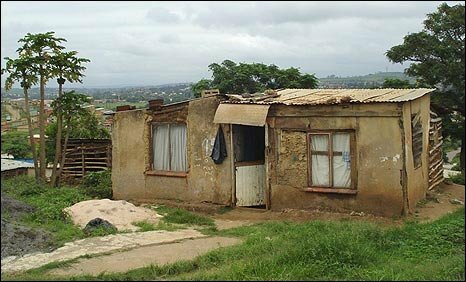 Millions of South Africans still live in shacks. Rain and dust get in, there is no security against burglars and shack dwellers have to go out to public stand-pipes to fill up containers with drinking water. And there is no proper lighting which - quite apart from the obvious inconveniences - makes it very hard for children to get their homework done on dark winter evenings. A former African National Congress activist, "Bricks" Mokolo, told me it is still very hard to criticise the government here. He says everybody has been, as he put it, "made to love the ANC, made to love Nelson Mandela" and "made to feel small" if they dare to complain. Mr Mokolo tells me angrily: "I didn't wait for Nelson Mandela. I too fought for my freedom. I was tortured in an apartheid jail." He was tortured so brutally that prison officers thought he was dead. After leaving him in a mortuary fridge overnight, they dumped what they thought was his dead body in a field. Mr Mokolo says that housing, especially, was better under apartheid than it is now. He calls the new houses that are being built all over the country an insult because they are significantly smaller than the old matchbox homes that the apartheid government built in the townships. "The ANC government now," he insists, "is simply an extension of the apartheid government. 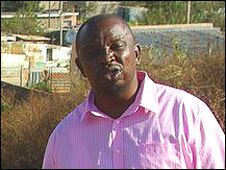 There's still separate development," he goes on, "there are still townships, 20 years after liberation." His conclusion: "There were places for blacks in those days. Now they are the same places. They've just changed the word. They've changed black, to poor." This is a radical outlook that I have heard much more often than on previous visits. A wave of strikes over the past few weeks is evidence of mounting frustration, despite the undeniable success of the growing black middle class in their smart homes and fast cars. "But what about us?" say the rubbish collectors who were on strike for 10 days in April, or the train and dock workers who were out for more than two weeks this month. Mineworkers were about to go on strike, too, a few days ago and were only stopped by a court order. If they had stopped work, there could have been a threat to power supplies during the World Cup. All the same, stadiums are taking precautions, installing generators and back-up generators. This reminds me of the last World Cup, when I was in Baghdad - power cuts, blanked-out TV sets during some of the games. That surely cannot happen here, can it? 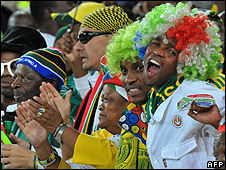 BBC World Service: See programme schedules.